Debora completed her degree in Phonoaudiology in 2004 in Brazil. She also completed Post-Graduation in Audiology in 2006 and added in 2012 studies in Acupuncture, thats was when she realised her affinity with holistic treatment. 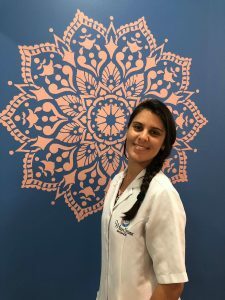 Debora started to include Massage prior to the Acupuncture treatments to increase and potentialise the effect of the needles and completed her Remedial Massage Diploma in 2016 in Australia. Debora can perform Relaxation, Remedial Massage, Hot Stones, Pregnancy, Lymphatic Drainage and Trigger Points Therapy. She believes in keeping the balance and harmonisation between body and mind to be the foundation of our health and wellbeing. Debora started massaging professionally around 5 years ago in Brazil, after she completed studies in Acupuncture. She found her affinity and passion with holistic treatment in order to help people and, started to include Massage into her practice. Debora graduated as Remedial Massage Therapist in 2016 in Australia. Since then, she can perform with excellence therapies such as Relaxation, Remedial Massage, Hot Stones, Pregnancy, Lymphatic Drainage and Trigger Points Therapy. She believes in keeping the balance and harmonization between body and mind to be the foundation of our health and well being.